Price: Monthly $17.99 Yearly & Lifetime discounts available. In this review, we here at Review2Sound are going to take a look into this product by Quincy Jones. The birth of Playground Sessions leads to the enormous progress in learning piano. The company has found the perfect formula to combine easy-to-follow video tutorials and the most sophisticated gaming technology. This provide a significant amount of help to users in learning their favorite songs without trouble. Dedicating some hours, one can gain more knowledge about rhythm, keyboard skills, notation as well as the idea on how to play by ears through your most-loved songs’ lens. Also, Playground Sessions made it simple for the users to study theory rapidly while having so much fun. Quincy Jones is a huge name in the international music industry. He was the brain behind Michael Jackson’s historic “Thriller” album. He got various Grammy nominations and awards and was named as one of the “Six Most Influential Jazz Musicians of the 20th Century” by Time Magazine. 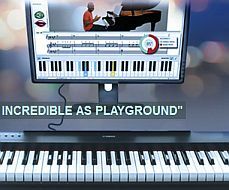 As cutting edge piano software, Playground sessions incorporates video tutorials, instantaneous interactive response and components of online gaming such as progress charts, scores and background music. This is ideal for all learner levels and gives the chances to enjoy One interactive video tutorials by David Sides. The best part of Playground Sessions is it creators. This was made with the concerted ideas and efforts of the biggest names in the music industry. He is a music legend and has a wide experience in every music genre. He has worked and collaborated with artists such as Stevie Wonder, Michael Jackson, Will Smith, Frank Sinatra and more. He has significant contribution in terms of the curriculum, learning methods and arrangements of Playground sessions. He is a YouTube sensation with more than 170 million views and received praises from Ryan Seacrest and other celebrities. David has composed hundreds of unique arrangements and is now one of the head instructors at Playground sessions. He is responsible for the curriculum development of Playground sessions and a musician and a professor. He was awarded with “NYU’s Outstanding Student Teaching Award” in 2009. Alex also works as a composer of many recognized new-music groups. He is the Washington Heights and Inwood’s founder and director. David is one of the 50 talented young musicians to take a part in the 2010-2011 Sistema Fellows Program at the prestigious New England Conservatory in Boston, MA. He is a recipient of the Ralph Vaughan Williams Research Fellowship and the Philip Brett Award. He is a music professor in the Music Department of the University of California and the proud mentor of David Sides. Playground Sessions is one of the best and simplest way to learn and love piano minus the pressure and difficulties. I hope we helped you have a quick look at what Playground Sessions can offer you in this review. Feel free to ask questions and comment below if you have anything in mind. Thanks again for visiting and I wish you good luck.